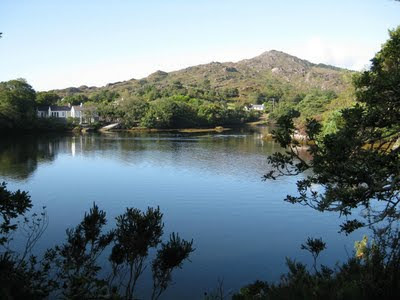 " You must not burn logs of Rhododendron wood on an open fire because the gas which they give off is extremely toxic"
This being a lesson that I learnt while walking with companions, through the shoreline woodlands that border one of the Glengarriff inlets. After me commenting upon a neatly stacked pile of Rhododendron logs. Here four of us were strolling on a balmy September morning, the second of a short break including two of my relations from that other island (see previous entry). The air was still, the temperature exactly perfect for me and so on spotting an open craggy place, that over looked the opposite shore I chose to sit awhile, alone and drink inwardly of the ambience. Whilst three walked on…. I have added this spot now to my growing list of places of where to visit, to meditate and commune with nature. On the coast of north Clare is another, a special solitary point that I know as Where Curlews Sing, for their song echoes across a wide bay, like a mantra designed to transcend the listener into a different consciousness and it does. Stilling the Mind: is a study and a practice that I under took many years ago, one of the better things that I have ever taken on and studiously maintained. Unlike a religion that entraps and ensnares. StM allows one to have freedom of thought, to be actually in charge of the Self and in control of the mind. It is the ability to be free in the truest meaning of the word. Twenty four hours later the three of us stood at Healy Pass on the Bheara Peninsula, after having driven up from Adrigole, along a a twisty road that can best be described as being like a Serpents Tail ! At the apex of the Pass (as with all passes) you get the impression of being at the top of the world, with superb views here in easterly and westerly directions. We stayed only minutes for our destination that day lay further to the west and the Ring of Kerry. My personal knowledge is that the best parts of the Ring lay not on the coastal roads, but on those small country roads found on the O.S maps that bisect the very middle and heart of Ring of Kerry. The suggestion of doing this fell on deaf ears as we, like every tourist before us, clung like fleas to the well beaten coastal roads. Continuing on from last weeks blog Snow Leopard has been loaded it is fully operational, without any visible glitches and all is as perfect as Apple claim it to be ! Today we are awaiting the arrival of special visitors from that island that lies between us and the european continent, on that island four old nations live in comparative harmony. These particular folk are from England two will arrive this day and two more tomorrow, neither couple knowing the other. It will be interesting to see how they communicate and interact when they get together both having the same language. The way in which the English speak English often denotes the class or the assumed class of the speaker, nowhere is this more apparent than in London and its outer areas where dialect is largely avoided by the professional classes and is a common form of snobbishness or so it seems to me. rarely occurs with the people from Northern or Southwestern counties. This past week I have been listening to the Beeb in order to attune my ears to hearing and deciphering English English, which is entirely different to that which is pronounced on this island. 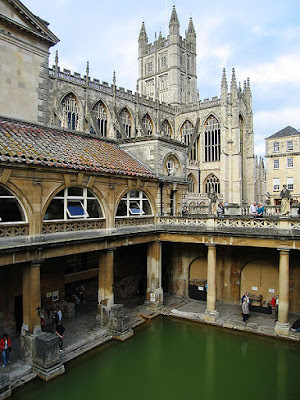 The most noticeable difference with the non dialect English is the addition of the R sound when using an A which sounds like AR for example Bath actually sounds like Barth ! They have been here, those non dialect English speakers, and after having had several drinks while sitting around the fire, their rich county accents have flowed out and warmed the atmosphere. Which makes me suspect that their adoption of the non dialect English in the first place stemmed from some sort of inhibition or insecurity. I do though understand the need to fit in when moving to a different area or country. Fitting in is done by being considerate to others, using common sense by not forcing your ways on them or comparing the new place with your last abode. Otherwise an outspoken neighbour might tell you to return to whence you came. Our accents do though change minimally and naturally as we unconsciously accept the different idioms of dialect of our new place of abode. Strangely, every person that meets us hears different parts of our voice; in much the same way as each person recognises facial features differently too. For example, I once shaved off my beard. Some people noticed right away while others didn't notice at all and some did not even recognise me until I spoke.